A choice of edit screen modes and professional, yet easy-to-use features make it a snap for anyone to transform raw video footage into impressive movies. Make sensational cuts, build special effects and 3D transitions and create your own soundtracks. An integrated CD & DVD authoring utility makes it easy to create animated chapter menus, like those seen on DVD videos, and record your memories onto CD & DVD. Enjoy the groundbreaking Windows Media High Definition technology and use the high image resolution of your PC monitor, projector, or HD-enabled TV device (via compatible-DVD player) to play crystal clear photoshows. The new standard format lets you experience the full multi-megapixel resolution with almost no loss and guarantees sharp contours, vibrant colors and great depth of focus. All you need is a few clicks to burn your movies with high-resolution menus onto CD or DVD: autostart-enabled for any PC! Simply choose between two high definition standard resolutions: 1280×720 and 1920×1080. For comparison: The PAL NTSC norm, for American TVs, can only handle 640×480 pixels. Turn your friends into pirates at the touch of a button with an eye patch, or transform children into little angels with their very own haloes. Enhance romantic memories by adding fireworks, or have it rain hearts. You can even make the family dog talk through comical speech bubbles. Refine your videos with funny gags at the touch of a button using animated fun motifs and high-quality decoration/text elements incl. sound, fitting comments and impressive effects, individually adaptable (position, size, rotation, etc. ), and fun for everyone. Give us your best shot, and upload it to your own free photo & video website. Whether from your camcorder, digital photo camera or mobile phone, you can now import everything that moves you and easily put it online in a snap. Output your movies in the right resolution for the internet and, if requested, in HDTV quality! Surprise your friends and family with your video messages, impress them with holiday footage or give your far-away loved ones something to smile about. There’s no limits to your imagination: All videos are automatically posted online at the desired bandwidth, complete with effects, text, speech commentary, and background music, and can be viewed with a simple click. Precise sorting and quick redesigning of whole scene processes with adjustable zoom in the new scene overview, integrated directly into the Arranger, you’ll always see what’s going on, even in large scale projects. Time-consuming navigation and tedious searching through large projects is finally a thing of the past. Switch from the fullscreen overview to the simple storyboard or detailed timeline views with a simple click. This way you’ll always have the perfect overview to stay in control. You want to perfectly synchronize your New Years fireworks’ video with the sound of the firecrackers? Or to precisely tag certain on-screen moments with text. Or to change to the next scene directly after the drum roll? And all this, without having to edit anything? 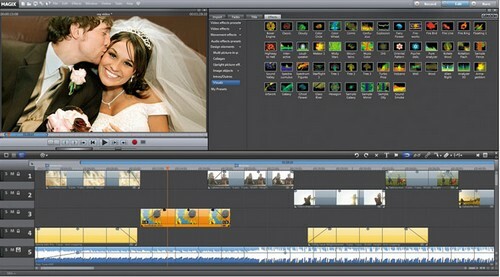 Then simply set a snap point at the desired positions in your video or sound file. You can now “magnetically” dock any video, audio or text objects you want and play them back synchronously.